Do you make New Year's resolutions like this fellow on the right? If you do it's okay. Almost everyone does. Problem is everybody makes them and then forty-eight hours later those good intentions are shanked somewhere off into the deep woods on the right. Then it’s “wait ‘til next year” and we’ve got 363 days of freedom. So why bother? However, making those New Year commitments should be different for golf. I think it’s important that each of us makes one, or perhaps more, golf-related New Year’s resolution. We should determine that we will maintain our golf sanity. So, with the commitment to make a commitment in place, the Eye On Golf staff has diligently compiled a short list to get you started. This list, as they say, is not all inclusive. It is provided for your motivation and guidance. DO SOMETHING EVERYDAY TO IMPROVE MY GOLF GAME. Yes, it’s a very broad resolution but very purposeful. Not everyone can get to the golf course or a practice facility every day, but that doesn’t mean you cannot do something everyday to improve. Even if the weather is frightful or your time is limited, you can stretch the muscles and then swing a weighted golf club for 15-20 swings. You’ll be amazed with the results. WALK NINE HOLES AT LEAST TWICE PER MONTH. Yes, you read that correctly. The game still can be played on foot. If your favorite golf course does not allow you to walk, go somewhere else. 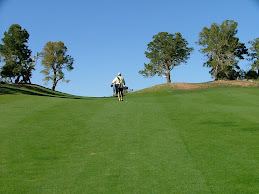 Not only is it great exercise to walk around the course, it will assuredly improve your game. And you can start getting in shape for that now! READ ONE GOLF-RELATED BOOK PER MONTH. No other sport lends itself to the production of literature like golf. A multitude of “golf” books are published every year, so you’ll be a long time catching up on your reading. Every category imaginable is available: instruction, biography, course architecture, reference, anthology, etc. You name it, it’s within your reach. If you're not sure where to get started go to Golf Book Review for some ideas. Get away from the magazines and a little into books. You'll be a better golfer and a better person for it. TAKE A TUNE-UP LESSON BEFORE THE SEASON BEGINS. If you’re in a location where you have forced hibernation and no golf for a few months, it’s a good idea to get a quick half-hour checkup before you head to the first tee for the first time in the new season. Having a qualified professional check your fundamentals, will bring you a lot more happiness and joy in the New Year and save a lot of aspirin. Shoot, the money you save on pain relievers, will probably pay for the lesson. There’s just four suggestions to get your golf imagination in gear. And there’s many more. Go for it.